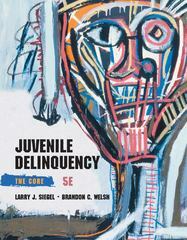 Juvenile Delinquency 5 Edition JUVENILE DELINQUENCY: THE CORE, 5th Edition delivers cutting-edge coverage of essential theory, policy, and the latest research in one value-priced, reader-friendly paperback. Renowned for its balanced approach and engaging writing style, this brief book helps readers understand the nature of delinquency and its causes, as well as current strategies being used to control or eliminate its occurrence. Available with InfoTrac Student Collections http://gocengage.com/infotrac.